A Tufts Innovates! seed fund grant will help Yannis Evrigenis and the Bodin Project at Tufts University to digitize Jean Bodin’s Les six livres de la republique. The work, which was published in French, Latin and English and contains copious references to other works, will form the basis of a dynamic variorum edition and will be used as a test-case for identifying text re-use across linguistic boundaries. Yannis has assembled a team of six undergraduate students and one graduate student to work on the digitization of Bodin’s Latin and French text, with help from Bridget Almas and Lisa Cerrato, as well as other members of the Perseus team. At the same time, the Tisch Library at Tufts has acquired a 1577 copy of Bodin’s French text and a 1609 copy of the Latin, which it has also digitized through the Internet Archive at the Boston Public Library. The extraction of the Latin text began in June 2013 and was completed in July 2013, while that of the French began in August 2013 and is continuing at present, albeit at a much slower pace, since several of the students have left to study abroad and everyone has returned to a regular schedule. Two of the students are continuing to work on the project under Evrigenis’s supervision, and in the spring semester, Evrigenis will be devoting a political theory methods seminar to Bodin and the parallel edition of the Six livres that will be open to undergraduates and graduate students who can read Latin. We will continue to work on the French simultaneously, and we expect to have the full French text by the end of the 2013-2014 academic year. 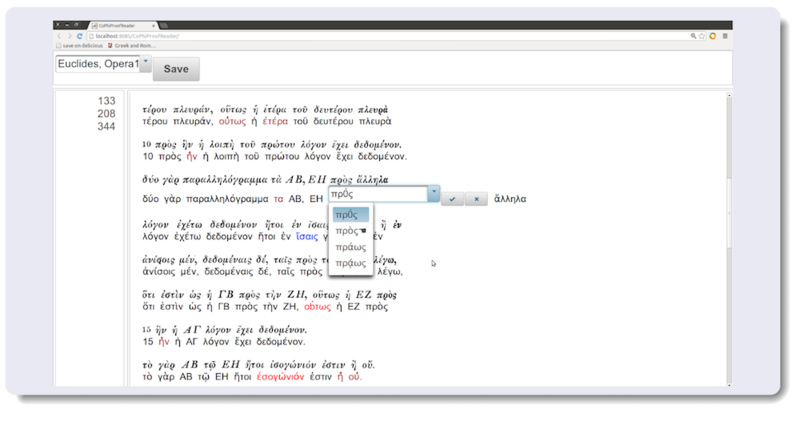 In the meantime, Bridget Almas has begun to test the Latin text against Morpheus, to identify word tokens that are not recognizable by a dictionary and may need to be corrected. We intend to subject the French to the same preliminary test, although the additional difficulty in that case will be to identify a suitable lexicon that will incorporate Renaissance French. We expect that workable editions of all three versions of the text will be available by the middle of the summer of 2014. Bruce Robertson and Federico Boschetti presented their latest work on ancient Greek OCR at an Open Philology workshop organised by Digital Humanities Leipzig at the University of Leipzig in August. You can follow their latest work on Github: Bruce’s work is here. Federico’s work is now in the Open Philology repository on github. Read the Digital Humanities Leipzig blog entry. 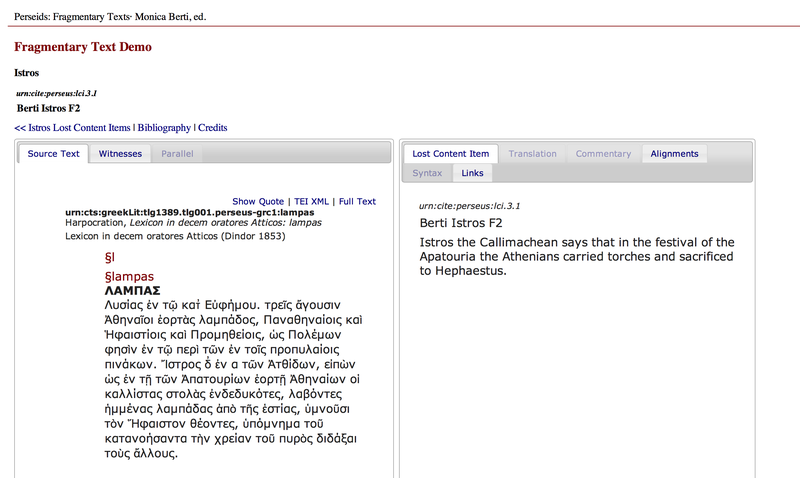 Bridget Almas and Monica Berti will be presenting a paper at DH-Case 2013 about the Fragmentary Texts Demo they have built using the Perseids environment for collaborative editing developed at the Perseus Digital Library. For more, see Monica Berti’s post. The international SAWS project has been funded by HERA, Humanities in the European Research Area. This first programme of trans-European research ends in summer 2013, and is being marked by a Festival of the Humanities in London. This will include a discussion of the implications of this programme for Digital Humanities. The SAWS Dynamic Library of Wisdom Literatures is due for preliminary publication in June, with a final version due by 15 August 2013. Gregory Crane, who was an investigator in DVE, has posted the research plan for his Open Philology Project at the University of Leipzig, where he is Humboldt Chair of Digital Humanities. This is a very exciting project, which will be looking at many of the same issues as DVE. Quotations and Text Re-uses in the Semantic Web” presentation at the Digital Classics Association conference in Buffalo, NY on April 5th, 2013. Bruce Robertson presented the back-end work on his polytonic Greek OCR at a University of Leipzig symposium with co-author Federico Boschetti. Perseus is adding support to SoSOL for the CTS/CITE Architecture and OAC core data model. It will enable the collaborative editing of texts in a framework of rigorous and transparent peer-review and credit mechanisms and strong editorial oversight. Perseids/SoSOL is being used at the Leipzig Atheneus hackathon. Bruce Robertson has published some preliminary results of a survey of OCR techniques for 19th century Greek.